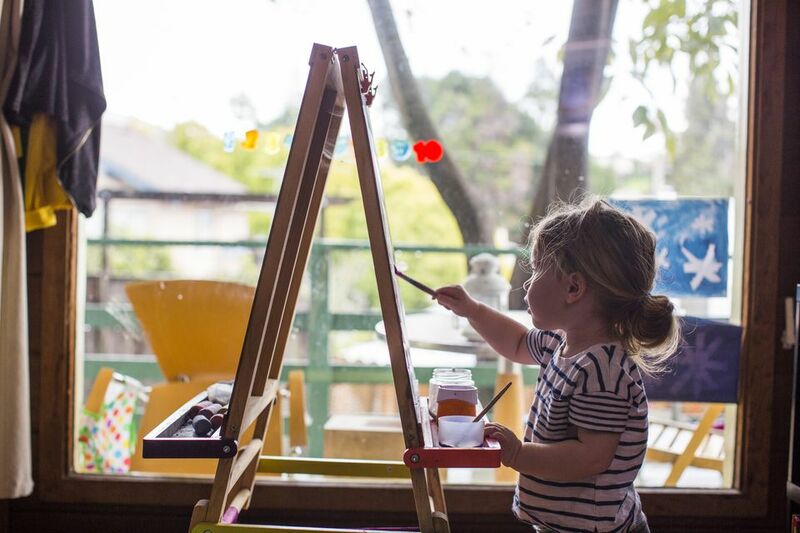 Lengthen your little one's attention span and spur creativity with well-planned craft time. From squirt gun painting to sticker lettering, here you'll find a bunch of solid ideas to fill any afternoon. Get a jump start on phonics for little ones with a fun weekly letter craft. Parents cut construction paper letters, then little ones can decorate to capture the spirit of an alliterated word. This handy tutorial provides free printables for less artistically-inclined grown ups. Letter of the Week from Crystal and Co.
Brightly painted and sectioned cardboard rolls make the wings for a colorful pipe cleaner butterfly. Kiddos will love imagining different patterns and designs for their butterfly wings, but they'll need a bit of help gluing the bug together. Practice letters and fine motor skills with dot stickers and pre-written names. Preschoolers are bound to enjoy making a bit of personal art, and parents will love the mess-free, quiet concentration time this project requires. Rigatoni gets the Monet treatment with this tactile craft. Toddlers can channel their inner designers to create watercolor pasta jewelry that's as much fun to create as it is to wear. Stamp painting is perfect for little hands, and creating this firework stamp from a recycled cardboard tube is quick and easy. Kids will spend hours painting fireworks (or starbursts or sunflowers or puffy clouds!). Low on paint? Make your own using mostly on-hand ingredients. Flour and oil combine to make a highly malleable, and incredibly fun, sculpting material. Toddlers can help mix the moon sand, then have a tactile and creative play time. Be sure to line the play surface with plastic–the oily sand can leave residue behind. Adults lay tape strategically over a canvas, poster, or construction paper, then preschoolers can paint directly over top. Peel the tape, and the negative space left behind reveals a secret message or image! Washi tape works especially well for this, and many other kids' crafts. Upcycle empty egg cartons into cute crawling critters with this easy project. Kids paint the egg cups, transforming them into shells, then twist a pipe cleaner into the perfect googly-eyed snail face. Grown-ups need to lend a hand to hot glue things together on this one. You'll need to wait for warmer months for this activity–it causes an outdoors-only kind of mess. Fill squirt guns with liquid watercolor paint, then let preschoolers go to town on sheets of construction paper clipped to a canvas or tacked to a tree. Toddlers get a bit of chemistry with their art in this activity–a little whole milk, food coloring, and a dish soap-dipped toothpick provide a play surface that will keep little ones entertained for hours. Kids also get firsthand experience at color mixing with this one! 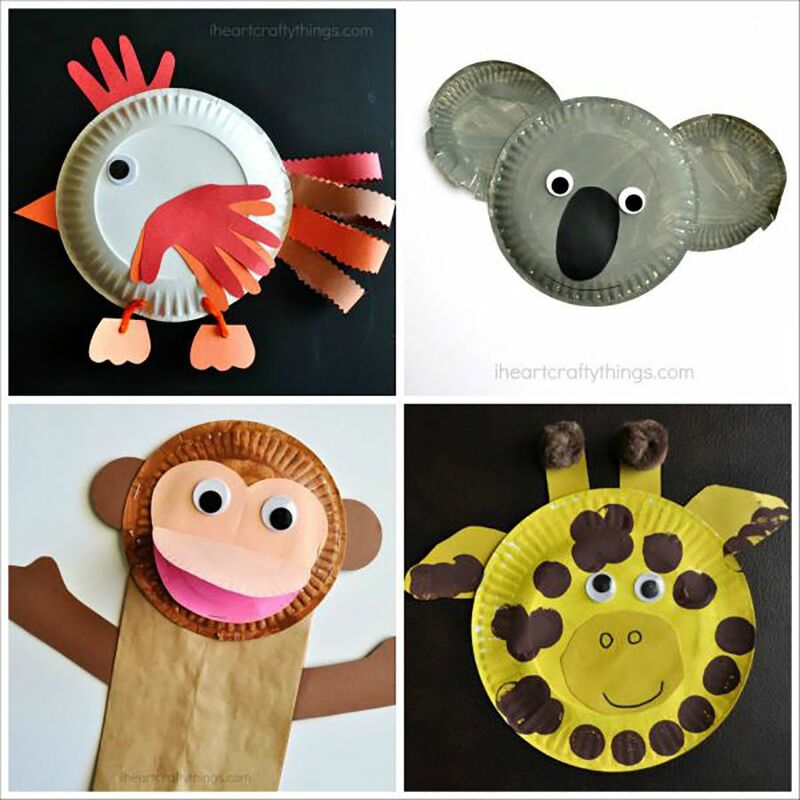 Bathroom supplies turn into wild creatures with this kids' craft! Drip watercolor paints onto cotton rounds (little ones will love watching the paint spread), then assemble into caterpillars on construction paper. Don't forget the googly eyes! Most preschoolers will jump at the chance to squirt liquids from plastic bottles–why not let them create beautiful temporary artwork while they're at it? Mix up a big batch of liquid chalk (cornstarch, vinegar, water, baking soda, and food coloring), then send kiddos out to the driveway to create. Clip bright straws into segments to create inexpensive, recycled beads that toddlers can string onto yarn. Kids can practice color recognition and patterning with this easy and mess-free craft. Sparkle takes center stage with this project–preschoolers cover craft sticks in glitter and sequins for their own homemade ornaments or magnets. Turn these into twinkling stars or sparkly sun catchers to make them appropriate for any time of year. Bring the garden indoors with this painting activity. Preschoolers apply fingerprints, thumbprints, or handprints to pre-drawn leaves and stems, ultimately creating a lovely field of flowers. Take your toddlers out for a day of bird sighting with their homemade binoculars! This easy tutorial gives great ideas for decorating TP rolls, then attaching two together with yarn to form the special, individualized specs. Kiddos forage for the decorations for these sun catchers, then assemble using clear contact paper and paper plates. Wild flowers and grasses stick to the contact paper like magic for kids, and with no messy cleanup, this medium may feel like magic for grown ups too.